I’ve been spending some time at Farm Sanctuary in Watkins Glen, NY and their Animal Acres in Acton, California. Great stories abound. I think you’ll enjoy hearing about the beautiful, and sometimes unexpected, friendships that form. Farm Sanctuary is home to hundreds of rescued cows, pigs, turkeys, chickens, goats, sheep and other farm animals, each with their own special story. Their tales are told to all sanctuary visitors to "give insight into the realities farm animals face in the modern factory farming industry." The majority of the animals that now live on the rolling hills of the Farm Sanctuary property, were once spending their days in horrific conditions in factory farms across the nation. They were taken in by the good people at Farm Sanctuary, who aim to protect all farm animals from this cruelty and inspire change in the way society views and treats farm animals, while promoting compassionate vegan living. Susie Coston is the National Shelter Director at Farm Sanctuary, caring for the well-being of the rescued animals both in the New York and California Shelters. We asked Susie if she could introduce us to some residence at the farm, and perhaps tell us a few animal friendship stories that have formed over the years. Hemingway was just 6-weeks old when he was dropped off at the front gate of the California Farm Sanctuary Shelter in Spring this year. Tired, sad unwell after being neglected and alone, the caretakers and interns at the shelter took turns looking after Hemingway and keeping him company in his stall. They treated him until he was well again and fed him until he was well nourished. However any time a caretaker would leave his stall, Hemingway would cry and call out for them to return, getting upset over the thought of being alone once more. 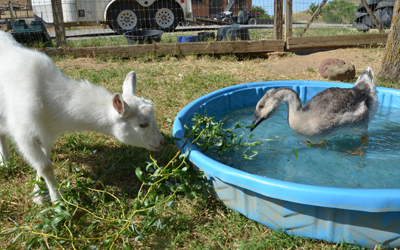 Meanwhile, Ryan the gosling had arrived at the shelter with bowed legs and a funny walk. He too was anxious and unhappy, in need of help and company from caretakers and friends. Neither Hemingway or Ryan were old enough or well enough to join the rest of their respective herds and flocks, and so they were destined to stay alone for a little while longer. That was, until the caretakers at the shelter came up with a plan: they would house the two babies together in one stall. 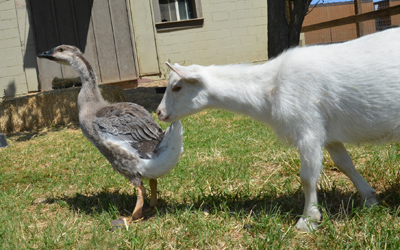 The goat and the goose became fast friends. They provided each other with the security and company that they each needed, and cured one another of their anxious ways. No longer did Hemingway cry when the caretakers left the stall. "Ryan doesn’t care that Hemingway has hooves, and Hemingway doesn’t care that Ryan has wings. They simply recognize each other as a friend to be at their side when they’re lonely or scared." 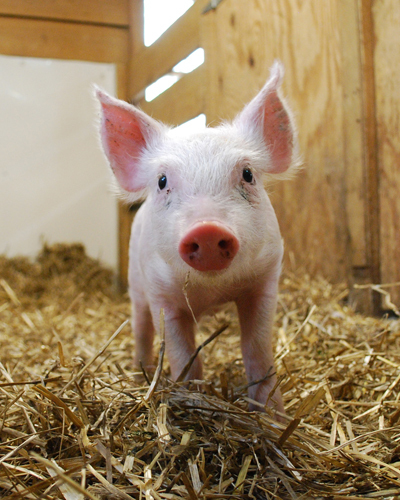 In 2010, a man was quietly driving along a busy highway in Illinois, when a tiny pink piglet fell out of a transport truck right in front of his car! He quickly slammed on the breaks and got out of the car to rescue the fallen pig who stood standing on the busy road. The transport truck had not noticed that the young pig had fallen, and continued on its way down the interstate. The man wrapped the small piglet up in his arms and brought him inside the car to take him home and care for him. A short time after the rescue, the man began to realize just how big this little piglet would eventually grow and how much love and care it would really need to live a happy life. Unfortunately, it seemed to be too much for him to handle on his own. He decided to ask around at the local rescues and see if any of the shelters could take him in and care for him as he had, but no one had room. Eventually, he and his friends decided to contact the New York Farm Sanctuary Shelter and see if they could help. The carers came right over to pick the piglet up! Straight away the knew they needed a name that "fit the pig's big personality" and decided to call him Bob Harper, after The Biggest Loser trainer who worked alongside them for their national Walk for Farm Animals. "Bob is continually making us laugh by crazily spinning around his hospital stall and shaking his blankets with his mouth like a puppy with a chew toy! Another one of his little games involves his breakfast. He loves the special mash we feed him and quickly slurps up all the milk replacer that is mixed in with the grain. When the liquid is all gone, he flips the bowl so that we have to clean the grain part up and make up another dish, adding more of the milk replacer that he, being a baby who was taken away from his mother and weaned much too soon, still prefers to eat." One Easter, two ducklings, Huey and Dewey, and a newborn chick, The Side Kick Chick, were being sold at a New York City pet store. As three young babies, they were taken in by the carers at New York Farm Sanctuary and brought to live together at the shelter. 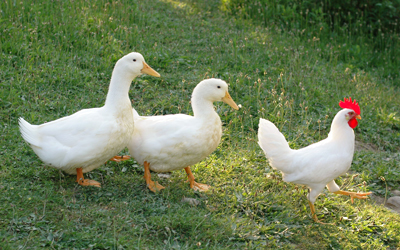 The three babies were placed in the duck and goose barn and grew up together. After a while it became obvious that The Side Kick Chick was actually a rooster, not a hen! Though he should have been moved to live with other roosters of his kind, he seemed to get very upset whenever he was away from Huey and Dewey. The carers at the sanctuary decided it was best to keep them together, and thankfully he got on well with the other ducks and geese. Of course The Side Kick Chick was a little different from the other members of his gang as he could not swim. 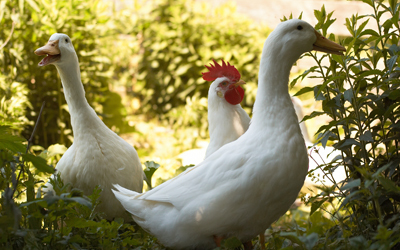 But regardless of this small difference, each morning, as an adult rooster, The Side Kick Chick would walk his two duck friends down to the pond for their morning swim. He was extremely protective and caring of his two friends, making sure that no other goose or duck mess with his pals and often stepping in to ensure that the young ducks were not picked on by older members of the flock. Their friendship was strong and true in every way, no matter that their species differed. They had an unbreakable bond from a very young age and remained a close trio through adulthood. Photo Credit: Derek Goodwin for Farm Sanctuary. Don't have room for a pet? Sponsor an animal instead! Healthy and delicious treats for your favorite four legged friends. the viedeo of the two blind cows meeting had me in tears, oh to be rich and open farm sanctuaries everywhere!!!!!! Thanks for this great article on Farm Sanctuary. Those involved in animal rescue are some of the kindest people in the world and the cruelty they are working to end can be soul crushing. They need all the help they can get. Two other sanctuaries you might consider writing about are: The Gentle Barn in Califormia and Poplar Spring Animal Sanctuary in Poolesville, MD. Thank you for spreading the word about domestic animal rescue. Take care.